A 2.3 mil cast, high gloss over laminate for digitally printed graphics. Textured brushed and carbon fibre wrap overlaminate ideal for achieving a textured look and feel. Envision 8548G is a 2 mil, non pvc gloss overlaminate with outstanding clarity and better scratch resistance during installation than standard cast vinyl overlaminates. Designed for use with LX480Cv3 and SV480Cv3 Envision print films. Durable nylon frame with polycarbonate lens. Scratch-resistant coating. High impact-resistant. 3645 is a 9 mil textured, scuff-resistant, UL rated, durable overlaminate which provides a slip resistant-surface for 3M IJ160 or IJ160C when used in the production of indoor floor graphics. 3M 8600 Decor cast, clear, textured overlaminates are designed to give your printed graphic the perfect textured finish. These five matte, textured laminates can help to reduce glare and reflections and add depth and interest to your overall wall graphics. 3647 is a 19-mil thick, matte, rough textured clear laminate film intended only for use with 3M 3662-10 for the production of floor and outdoor sidewalk graphics. It is ideal for sidewalk signs, promo posters, exterior signs, and exterior promotions. 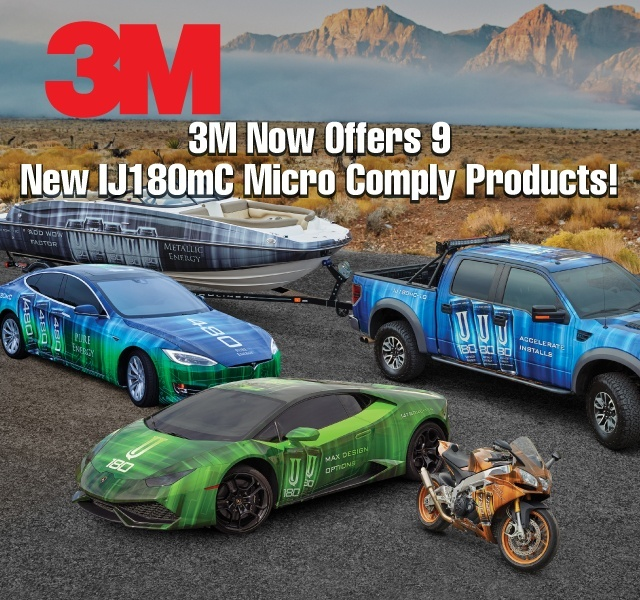 3M Envision overlaminate 8549 is versatile enough to wrap everything from vehicles to trailers to boats to textured buildings. This film is an environmentally friendly option to offer those looking for a greener solution. 3600 series cast overlaminate adds an extra measure of long-term durability to sign graphics. Use with Scotchcal Translucent Graphic Film 3630, Envision Translucent Film 3730 or Panagraphics III Flexible Substrates. A 3mil, calendered, lustre UL rated laminate for floor graphics and other digitally printed graphics. 2 mil Cast, Gloss Overlaminate that provides a glossy "paint-like" finish optimized for the fast-growing vehicle wrap market. 3M Scotchcal Gloss Overlaminate 8528 is a 2 mil gloss, vinyl that protects your customer's look and adds durability to wraps. It reduces the harmful effects of UV light and acid dew on the film, ensuring that wraps last longer and look better. A 2 mil cast, lustre overlaminate. An extremely versatile overlaminate and is an excellent choice for almost all graphic applications. A 2 mil cast, matte overlaminate. It has the same conformability and durability characteristics as 8519 and is ideal for use indoors or outdoors where a flat sheen or minimal glare is required. A 2 mil cast, lustre overlaminate designed for use with IJ8624. This film comes on a kraft paper liner. This 3.0mil polyolefin overlaminate is manufactured with less solvent, making it an ecologically responsible choice. Use for many short-term digitally printed or screen printed graphics that don't require heat or stretching during installation. Available in Lustre or Matte. This overlaminate offers impressive glare-reduction and long-term durability for most digitally-printed graphics. 4 mil, graffiti resistant, clear, permanent, polyester film with pressure-sensitive adhesive. It adheres to flat, smooth, untextured surfaces, as well as simple curves. A durable, high gloss, transparent graffiti resistant cast overlaminate with a clear, permanent adhesive. Designed for overlaying onto flat surfaces and offers outstanding protection. A durable, matte, transparent cast overlaminate with a clear, permanent adhesive. Designed for overlaying onto flat surfaces and offers outstanding protection. 2 mil clear polyester overlaminate that offers graffiti resistance with anti glare finish for indoor use. 3M Textured Vinyl FV02610N is a 5mil flexible and conformable clear vinyl and overlaminate stock that offers durability and moisture resistance. A cost effective alternative to Lexan. A 1 mil, gloss overlaminate on a clear liner with clear permanent acrylic adhesive. Use for short term flat surface applications. A 3 mil overlaminate on a clear liner with clear permanent adhesive. A 5 mil overlaminate on a clear liner with clear permanent adhesive. Tough and dimensionally stable polyester film intended for the protection of public transport vehicles, high quality advertising, and signs for both interior and exterior applications. ASLAN ClearBoard are semi-permanent 3.15mil, CB 75 Matte or CB 90 Gloss, clear dry-erase / whiteboard over laminate films. ASLAN SL 109 EcoSoftTouch is a 1.9mil, ultra matte, no glare, protective polypropylene (PP) laminate for high colour brilliance for flat, smooth surfaces. Avery DOL 1000Z Series has been optimized to pair with MPI 1105 Supercast films and have outstanding conformability and deliver a high-gloss, paint-like finish. DOL 1360Z is a 1.3mil, premium quality, ultra-thin, ultra-conformable optically clear cast vinyl film on a 2mil transparent synthetic liner. DOL 1370Z is a 1.3mil, premium quality, ultra-thin, ultra-conformable lustre finished clear cast vinyl film on a 83# paper liner. DOL 1380Z is a 1.3mil, premium quality, ultra-thin, ultra-conformable matte clear cast vinyl film on a 83# paper liner. DOL 1460Z Gloss is a 1.3mil high gloss cast overlaminate on a 2mil transparent liner for optimal clarity. DOL 1400Z Series Clear Cast Vinyl is a premium quality, ultra-thin, superconformable cast vinyl film designed to be used with MPI 1105 SuperCast Series. A 2.1 mil cast overlaminate with a matte finish. A 3.1 mil calendered overlaminate available in a Gloss, Lustre or Matte finish with a clear, permanent adhesive. These overlaminates are UL recognized for slip resistance and can be used for the production of indoor floor graphics. A 3.1 mil calendered overlaminate with a gloss finish and clear, permanent adhesive. A 3.1 mil calendered overlaminate with a luster finish and clear, permanent adhesive. A 3.1 mil calendered overlaminate with a matte finish and clear, permanent adhesive. Avery DOL 6040 Clear Sparkle is a premium quality, flexible film designed for use as a protective overlaminate film for screen and digitally printed decals. DOL 6040 Clear Sparkle provides a metallic look to standard printed decals. A 1.0 mil clear, ultra-thin, polyester overlaminate designed to protect indoor and outdoor graphics against chemical and mechanical attack. 1.5 mil clear polyurethane laminate designed for use as a protective overlaminate film for screen and digtially printed decals. This film is premium quality, ultra-conformable, aliphatic polyurethane 8mil film with an adhesive system designed for new generation of automotive clear-coats and other typical OEM surface finishes. T-1500 Engineer Grade Reflective sheeting is a high quality, durable, enclosed lens retroreflective material. The reflective sheeting offers exceptional value for permanent traffic signage applications. 6.5 mil rigid overlaminate that's non-plasticized, dimensionally-stable. Ideal for high-quality markings or decal applications that require durability. A 12 mil heavy duty, flexible clear vinyl laminate with permanent acrylic adhesive and an extremely durable surface and resistance to failure in abusive applications. A 7 mil heavy duty, flexible clear vinyl laminate with permanent acrylic adhesive and an extremely durable surface and resistance to failure in abusive applications. DreamGuard Protex3 satin liquid laminate is for textured and smooth wall coverings. This liquid laminate protects walls from marks, scuffs, scrapes and staining. A 4mil monomeric, soft calendared PVC laminating film with gloss finish, with UV stabilizers to protect against UV degradation and mechanical damage. 4 mil calendared PVC laminating film in a matte finish, with UV stabilizers to protect against UV degradation and mechanical damage. A 4mil monomeric soft calendared PVC laminating film with a lustre finish and UV stabilizers to protect against both UV degradation and mechanical damage. 5mil monomeric calendered PVC laminating film with a matte, pebble finish with UV stabilizers. UL recognized for use in floor graphics and FDA approved for incidental food contact. For floors, retractable banner stands and exhibit stands. Interlam Pro Anti-Graffiti UV is a 2mil, high performance PCTFE barrier film with very strong anti-graffiti and dry erase characteristics. Long-term indoor and 7 year outdoor durable. Wipe Erase (Previously WipeOut) Premium Dry Erase 2 mil clear laminate is easy to write on and to wipe off. The chemical and scratch-resistant UV hardcoat, clear gloss surface and anti-graffiti qualities safeguard against ghosting or staining from ink. A 3 mil economical, thermal low temperature overlaminating film with a dry-erase gloss finish. 5mil or 10mil HD clear PET laminating film with a high gloss finish, coated on one side with a pressure sensitive, solvent acrylic adhesive on a siliconized PET release liner. A 5 mil heatset laminate with scuff-resistant PVC and pebble textured matte finish. 4 mil embossed, clear overlaminating film with matte finish. 3 mil general purpose satin-matte HeatSet overlaminating film. Versatile, 3 mil HeatSet overlaminating film with semi-gloss finish. 3 mil high clarity, low temperature overlaminating film with gloss finish. 5 mil high clarity, low temperature overlaminating film with gloss finish. 10 mil high clarity, low temperature overlaming film with gloss finish. 3 mil low glare, low temperature overlaminating film with lustre finish. 1.7 mil economical thermal overlaminating film available with a matte or gloss finish for paper prints. 4.9 mil non-glare, scuff resistant PVC overlaminate with a pebble finish. A monomeric, calendared, 3-year, 4mil, PSA laminate in three finishes and two widths. This is the companion laminate to the Polar Vinyl range. Protac Polycarbonate is a clear 10 mil polycarbonate laminating film with a velvet matte pebble textured finish. A 3.2mil (80µ), 2-year outdoor, monomeric soft calendered PVC laminating film available in gloss, matte, and lustre finishes. A 3.2 mil (80µ) monomeric soft calendered PVC laminating film with a sand textured finish for retractable banner stands and trade show booths. 4.2 mil monomeric calendared PVC laminating film with a satin pebble finish. Protac Scribe is a 2.5 mil pressure-sensitive gloss film with a specially treated surface making it appropriate for dry-erase applications. A 3 mil Vinyl With a Slight Textured Surface and Aggressive Adhesive. ClearShield Production Clear Liquid Laminate was specifically formulated to work with the unique characteristics of UV-curable inks. Production Clear also works well over Eco-Solvent inks. ClearShield Canvas Guard is the ideal coating for canvas and fine art applications. It is formulated for flexibility so that canvas can be stretched after coating. Apply with spray, foam applicator, or roller. Water-based liquid laminate designed for use with the StarLam Liquid Laminator or other automated laminates, that can offer the same protection as film laminates. ClearShield Anti-Graffiti is a two-component, water-based liquid laminate with excellent chemical resistance. It is well suited for high performance applications where hardness, flexibility and abrasion resistance is required. Not recommend for use with eco-solvent inks. Clearshield Classic is a clear liquid laminate, for hand or roller application. Suitable for vertical applications. These non-yellowing clear coatings have excellent exterior durability and are highly flexible. Wall Armor is a satin finished, Type II certified liquid laminate made for wall covering applications. It offers stain, scratch and abrasion resistance as well as fire retardancy. For hand or laminator application. Compatible with latex, ecosolvent and UV-curable inks. MetaGuard 305 is a 2.8mil, gloss matched laminate for Metamark's MD3 media, and delivers mutual conformability and weathering to actively preventing tunnelling or delamination. 702 Matte, 703 Satin and 705 Gloss series calendered overlaminate with UV inhibitors suitable for lamination of interior or exterior applications to increase durability. This film is designed for use with all Metamark MD5 digital print media. O'Lambrite 1mil optically clear overlaminate is a 1mil PVC coated with a solvent acrylic adhesive, combined with 3mil a PET liner. Ideal for short term or promotional installations. O'LamBrite Decal is a 3mil calendared, PVC pressure sensitive over laminate with UV resistance for indoor and outdoor use. Added flexibility makes this perfect for cut decal and label work. 3 mil, calendered pressure sensitive overlaminate for use on printed substrates.